Tuesday, September 9 at WKAR! 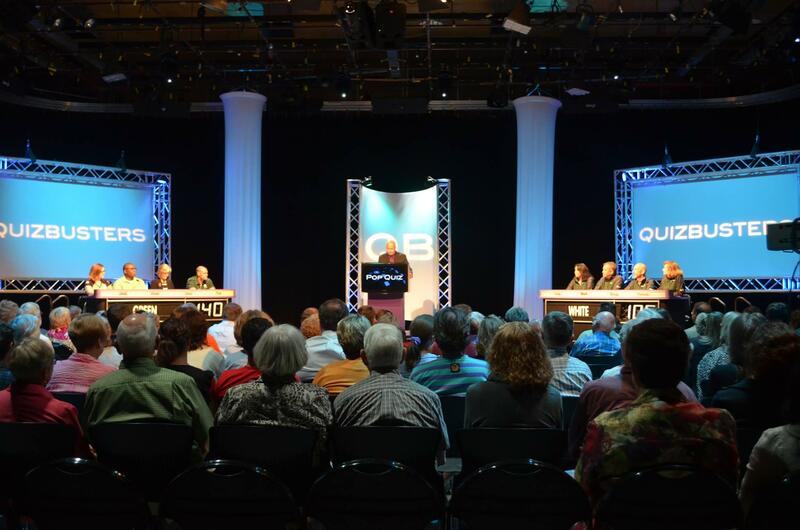 Join fellow game show fans and meet some of mid-Michigan's most notable personalities as WKAR launches a new season of QuizBusters with two Special Edition episodes recorded with YOU in our live studio audience. FREE! The two special QuizBusters episodes will be recorded on Tuesday, September 9, at WKAR TV studios in the Communication Arts and Sciences building on the Michigan State University campus. Doors open at 6:30 p.m. Two games will be recorded back-to-back. There is no admission charge. Competing in game one are WILX meteorologist Darrin Rockcole, entertainer Wally Pleasant, MSU coach Jacquie Joseph and WLNS reporter Emerald Morrow playing WKAR's Scott Pohl, Sexton HS coach Carlton Valentine, actor Doak Bloss and Sweetie-licious owner Linda Hundt. Competing in game two are Robin Miner-Swartz of the Capital Region Community Foundation, MSU basketball star Andre Hutson, singer Rose Jangmi Cooper, and John Steven French from Abrams Planetarium against Lansing State Journal sports writer Chris Solari, LCC Theatre's Andy Callis, Tashmica Torok of the Firecracker Foundation and Meridian Township manager Frank Walsh. Check this page and follow WKAR on facebook for updates. FREE seating is FIRST COME, FIRST SERVED - advance registration is not required. QuizBusters Special Edition recording takes place in WKAR Studio A in the Communication Arts & Sciences building, 404 Wilson Road on the campus of Michigan State University. Parking is free after 6 p.m. at non-metered spaces in the Trowbridge Road parking ramp, near the South, Main Lobby. The two QuizBusters Special Edition 2014 episodes will premiere on Saturday, October 4, at 6 p.m. and 6:30 p.m. on WKAR-TV, with repeats Sunday (Oct. 5) at 11 a.m. and 11:30 a.m. QuizBusters returns to its regular format the following week in the same time slots, featuring more than 60 teams from mid-Michigan high schools competing for scholarships to Michigan State University. This is the third year that WKAR has kicked off a new season with special guest episodes. Past episodes featuring guests such as Lynn Jondahl, Kat Cooper, Tico Duckett and Jane Aldrich can be viewed online at video.wkar.org. All recent QuizBusters episodes are also available on Roku, Xbox 360, Apple TV, and iPad/iPhone in the PBS app.